Impeachment of Andrew Johnson: Andrew Johnson was the 17th American President who served in office from April 15, 1865 to March 4, 1869. One of the important events during his presidency was his Impeachment trial. Summary and definition: The Impeachment of Andrew Johnson commenced on Monday, February 24, 1868, when the House of Representatives of the Congress of the United States resolved to impeach Andrew Johnson, President of the United States, of high crimes and misdemeanors. President Andrew Johnson had to answer 12 articles of Impeachment and was acquitted in the Senate by one vote less than the two-thirds necessary to remove him and was allowed to continue his term of office. 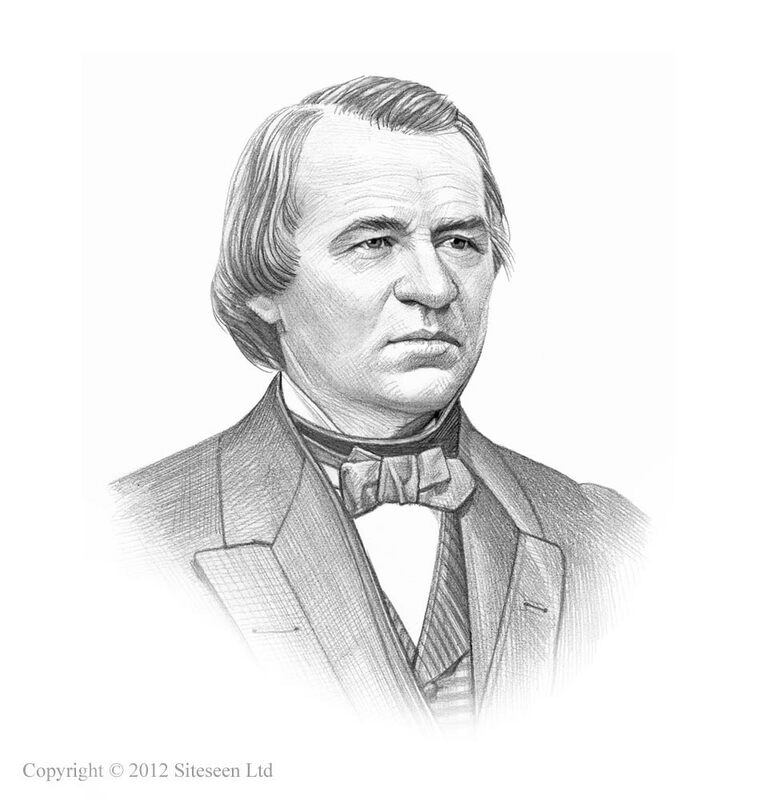 In the Impeachment trial of Andrew Johnson he was accused of "high crimes and misdemeanors". Impeachments trials are held in the Senate with the Chief Justice of the Unites States Supreme Court presiding. An Impeachment trial is conducted in the same way as a court with witnesses and cross-examinations. The reason that Andrew Johnson was impeached was for his removal of Edwin Stanton, the Secretary of War and member of his cabinet, in violation of the law called the Tenure of Office Act. Interesting Facts about the Impeachment of Andrew Johnson for kids are detailed below. The history is told in a factual timeline sequence consisting of a series of interesting, short facts providing a simple method of relating the history and events leading to the Impeachment of Andrew Johnson for kids, schools and homework projects. Andrew Johnson was a Southern Democrat and, as such, had sympathies with the Confederacy and granted pardons to ex-Confederates on a large scale. He was inexperienced, a stubborn man with little patience. The government consisted of many radical Republicans and before long the President and Congress were in conflict due to Reconstruction Policies. The radical Republicans believed that the President was behaving too leniently towards the Southern states who were attempting to restore self-rule and passing state laws referred to as the Black Codes. At the end of 1865, just six months after the end of the Civil War Andrew Johnson declared the end of Reconstruction. The radical Republicans were outraged and were determined to establish a Congressional Reconstruction. The Southern Democrat President and the radical Republicans were in direct conflict and on a collision course that would end with the Impeachment of the President. Republicans passed the Civil Rights Act of 1866 overriding the President's veto. Congress passed the first of the Reconstruction Acts, overriding the President's veto, which gave them military and political control of the Southern states. Congress passed the Tenure of Office Act on March 2, 1867, overriding the President's veto, to limit the President's powers and prevent him dismissing radical Republicans from office. The President continues to oppose congressional policy, and insists on the removal of the radical Secretary of War, Edwin M. Stanton, in defiance of the Tenure of Office Act . Edwin Stanton refused to move and barricaded himself in his office claiming that the Tenure of Office Act protected him. Congress supported Edwin Stanton's claims asserting that by suspending Edwin Stanton and removing him from his cabinet without the consent of Congress, the President Johnson had breached the Tenure of Office Act. It is the right of the House of Representatives to impeach. It is the right of the Senate to try and determine impeachments. Constitution: The Constitution of the United States refers to the process of Impeachment in Article II, Section 4 of the Constitution. On Monday the March 2, 1868, eleven articles of impeachment were agreed by the House of Representatives. May 26, 1868: The final vote was taken in the Senate on the second and third Articles of Impeachment and Johnson was again acquitted. The Impeachment trial of Andrew Johnson is over.